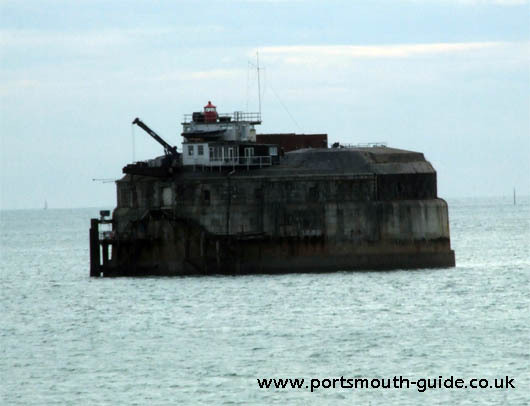 Portsmouth's Sea Forts consist of Spitbank fort, St Helens Fort, Horse Sand Fort and No Mans Land Fort. Spitbank fort was designed to provide a defence for Portsmouth Harbour from French Invaders. Work began on Spitbank in 1861 and in June 1878 the fort was completed. It was intended to mount 15 guns looking seaward, and six facing landward. The construction of the fort had cost £117,964. In 1871 the Defence Committee recommended that the fort be rearmed with more powerful guns. Nine, 12.5-inch, 38-ton guns were installed on the seaward face and seven 7-inch 7-ton guns on the landward side. In 1882, Spitbank Fort was supplied with auxiliary armament in the form of 15 machine guns. In 1899, the role of the fort was changed to counter light craft instead of heavy warships. Two 4.7-inch guns were fitted on the roof and searchlights were added. In 1956, the Coast defence program was disbanded and the searchlights and generators removed from the fort the following year. The forts never came under attack and in 1952 the fort was sold. Now Spitbank fort is open to the public. St Helens Fort, Horse Sand Fort and No Mans Land Fort were all built at a similar time and were never attacked. These forts are privately owned and not open to the public. For more information about Spitbank Fort have a look at www.spitbankfort.co.uk.